The East/West Boulevard station is a rail station on the LYNX Blue Line in the South End of Charlotte, North Carolina, U.S.A.. The station officially opened for service on Saturday, November 24, 2007, and as part of its opening celebration fares were not collected. Regular service with fare collection commenced on Monday, November 26, 2007. This is known as the East/West Boulevard station, as it is located at the intersection where East Boulevard becomes West Boulevard upon crossing Camden Road. It has side platforms, which sit on either side of the tracks. As part of the CATS Art in Transit program, East/West features several pieces intended to provide a better overall aesthetic for the station. The works include bas-reliefs entitled Hornbeam by Alice Adams, drinking fountain basins designed to look like dogwoods, the North Carolina state flower, by Nancy Blum, cotton plant motifs on both the pavers and shelters by Leticia Huerta, a 360 feet (110 m) mosaic along a wall facing Camden Road by Thomas Thoune and track fencing featuring beech leaves by Shaun Cassidy. 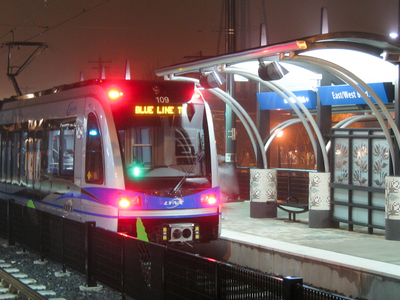 Here's the our members favorite photos of "Metro Stations in Charlotte". Upload your photo of East/West Boulevard Station!